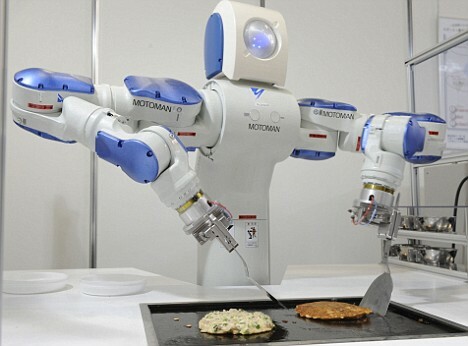 Talented robot Motoman SDA10, which produces the company Yaskawa Electric’s industrial, has two hands, and they demonstrated their ability to “okonomiyaki” International Fair next generation of robots in Osaka. Okonomiyaki – fried cake of a mixture of various ingredients. Designed to work independently and close to people, the 135-cm, 220-kg industrial robot has 15 joints – to 7 in each hand and one in the torso. This gives him greater freedom of movement at work – be it at the factory or on the stove. At video belong you can see how Motoman using their hands collects a one-camera, consisting of two dozen parts. This requires 2 minutes.